A number of other surgical and non-surgical specialties may be involved in the care of the patient with a facial palsy, e.g. an ENT (ear, nose and throat) surgeon, a neurosurgeon, a neurologist, a plastic surgeon, a physician. It is essential that effective communication exist between such doctors for the optimal care of the patient with a facial palsy. The ophthalmic surgeon must be made aware of the prognosis for recovery of facial nerve function, e.g. following the removal of an acoustic neuroma, and of any plans for surgery by other colleagues, e.g. facial reanimation surgery. The impact of a facial palsy on a patient is not under-estimated. 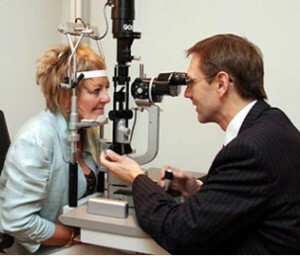 The main objective is to protect the cornea (the clear “window” at the front of the eye). Sight threatening complications of a facial palsy relate to a condition referred to as corneal exposure (exposure keratopathy) in which the front of the eye, which is normally lubricated and protected by blinking of the eyelids, can become dry, scarred and even ulcerated when the eyelids are unable to close. The problems of exposure of the cornea are even more serious in a patient who has lost corneal sensation. Such patients are unaware when the eye is dry, or ulcerated, or has sustained any damage from simple rubbing of the eye, or exposed during sleep if the eyelids are not fully closed. 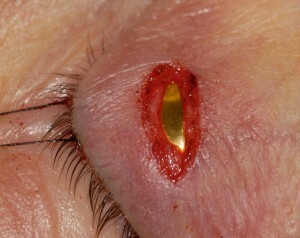 Often a red eye in these situations will alert the patient to the presence of corneal exposure. If the eye becomes red then you should consult your surgeon as soon as possible. A number of relatively simple medical treatments can be used, particularly for a limited time in the patient who has a good prognosis for the recovery of facial nerve function and who has no major risk factors for the development of exposure keratopathy. The most common ophthalmic treatment for facial palsy is the use of frequent artificial tears or ointments. These should be used at least on an hourly basis during the day and should be preservative free to avoid corneal toxicity from such frequent exposure to preservatives. The use of preservative free lubricant ointment e.g. Lacrilube, provides more efficient corneal protection than drops with a much reduced frequency of instillation but unfortunately with more blurring of vision. Patients should avoid ocular irritants wherever possible, e.g. tobacco smoke, dusty environments. Most patients do not like to use moisture chamber goggles or plastic wrap occlusive dressings but spectacle side shields are relatively unobtrusive and can be well tolerated. The upper eyelid can be taped closed over the eye at night using Micropore tape but it is essential to ensure that the eye is fully closed to prevent further damage to the cornea from contact with the tape. Botulinum toxin can be injected into the levator muscle in the upper eyelid to induce a ptosis for a patient with a temporary facial palsy. 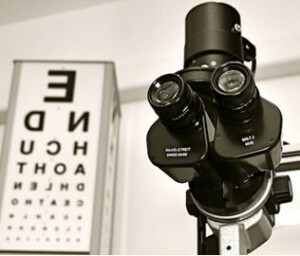 This is, however, expensive and commits the patient to monovision (seeing with one eye) for a period of 8–12 weeks before spontaneous recovery occurs. 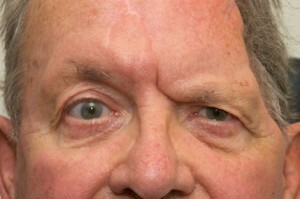 Some patients can develop problems with fusion and suffer diplopia (double vision) following the use of botulinum toxin. In addition, as the superior rectus muscle can be weakened, the protective Bell’s phenomenon may be adversely affected, creating more problems with exposure of the cornea during the recovery phase. 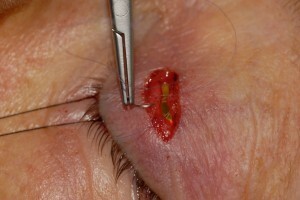 An external eyelid weight may be applied to the upper eyelid with a tissue adhesive. The weight is flesh coloured to make it less conspicuous. Such weights are useful for a temporary facial palsy but can also be used for a trial period before subjecting a patient to an upper eyelid gold weight implant. In patients with decreased tear production who cannot be managed adequately with artificial tears and ointments alone, punctal occlusion can be beneficial. This can be achieved temporarily with the use of silicone punctal plugs. If these are tolerated without secondary overflow tearing, permanent punctal occlusion can be performed surgically under local anaesthesia. A temporary suture tarsorrhapy can be used for the patient who has an acute facial palsy and who is unsuitable to undergo any other procedure or who is unable to instil lubricant drops or ointment. A 4/0 nylon suture is passed through the margin of the upper and lower eyelids and tied over silicone or rubber bolsters. 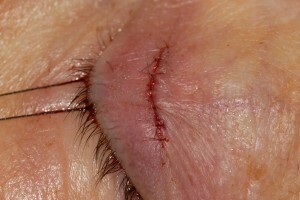 The suture (stitch) can be tied with a slipknot enabling the tarsorrhapy to be opened to examine the eye. A lateral tarsorrhaphy has been the time-honoured minor surgical method of providing adequate corneal protection in the management of the patient with a facial palsy. This involves the stitching together of the outer aspects of the eyelids, which then heal together. The procedure can be reversed. In this procedure the inner aspect of the eyelids are fused together surgically. This procedure is often used in addition to a lateral tarsorrhaphy to further improve corneal protection in a patient with a facial palsy. It also helps to prevent the development of a lower lid ectropion in the inner third of the eyelid. The removal of Müller’s muscle and a gentle recession of the upper eyelid retractors may benefit the patient with a chronic facial palsy who has upper eyelid retraction. These procedures are undertaken on the inside of the upper eyelid to lower the eyelid thereby reducing the area of the cornea that is exposed. Gold (or platinum) weight implantation is a simple and useful procedure for the patient with a chronic facial palsy. It is very useful in the patient who has undergone a lateral tarsorrhaphy and is dissatisfied with the cosmetic appearance, and wants the procedure to be reversed. The success of gold (or platinum) weight implantation depends on very careful patient selection. The procedure can improve voluntary eyelid closure but it does not restore a normal reflex blink. The management of greater degrees of ectropion in a patient with a facial palsy depends on an evaluation of the causes of the ectropion, e.g. 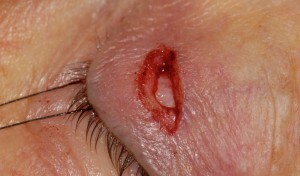 chronic overflow tearing may lead to cicatricial (scarring) changes in the lower eyelid that may require a skin graft procedure. In patients who are poor candidates for a facial reanimation procedure by a specialist plastic surgeon, the mid-face ptosis may be addressed either with a static sling using fascia lata from the thigh to pull the lip and face upward toward the bone of the zygomatic arch in the outer cheek area, or with a sub-orbicularis oculi fat (SOOF) or mid-face lift. These procedures help to relieve the downward traction of the sagging face from the lower eyelid. In spite of the successful correction of a lower eyelid ectropion, and the improvement of eyelid closure and corneal exposure, the patient may still experience chronic watering of the eye due to a poor lacrimal pump mechanism. In such cases it may be necessary to resort to an endoscopic conjunctivo-dacryocystorhinostomy (CDCR) with placement of a Lester Jones tube. A unilateral brow ptosis may be severe enough to cause impairment of the superior visual field as well as a cosmetic deformity (Figure 7.25). It can cause a pseudo-blepharoptosis (an apparent but not true droop of the upper eyelid), and may lead to a secondary misdirection of the upper eyelid lashes which can irritate the eye. A direct brow lift is a simple but effective procedure to correct a unilateral brow ptosis. 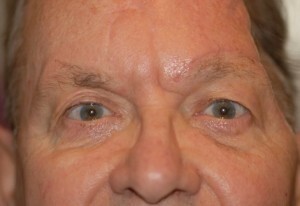 It can be combined, if necessary, with an upper eyelid blepharoplasty. If a blepharoplasty is deemed to be necessary, the brow lift should be performed first. The blepharoplasty should be very conservative to avoid aggravating any incomplete upper eyelid closure. An endoscopic brow lift in the management of a unilateral brow ptosis avoids visible scars but is less likely to provide a long lasting result. Aberrant reinnervation can occur following recovery from a facial palsy. This refers to the “mis-wiring” of branches of the facial nerve, with branches supplying the wrong muscles. The degree of disability from aberrant reinnervation is variable. Some patients experience complete eyelid closure when using the perioral (mouth) muscles. Such patients may be treated with botulinum toxin injections to the orbicularis oculi muscles (the eyelid muscle responsible for reflex and voluntary eyelid closure), but such treatment can worsen incomplete eyelid closure and increase the need for frequent topical lubricants. Direct neurotization of the cornea using the contralateral supraorbital and supratrochlear branches of the ophthalmic division of the trigeminal nerve is a procedure that may restore some corneal sensation to selected patients with a unilateral facial palsy and an anesthetic cornea. After surgery, depending on the surgical procedure which has been undertaken, the eyes are initially covered with pressure dressings for approximately half an hour to reduce postoperative swelling and the wounds are treated with antibiotic ointment. The dressings are then removed and replaced with cool packs. Activity is restricted for 2 weeks to prevent bleeding. You will be asked to clean the eyelid/brow wounds very gently using clean cotton wool and Normasol (sterile saline) or cooled boiled water and repeat the application of antibiotic ointment (usually Chloramphenicol or Soframycin) to the wounds 3 times a day for 2 weeks. 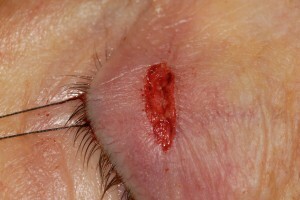 The sutures used are dissolvable but are usually removed in clinic after 2 weeks. Wearing make-up should be avoided for at least 2 weeks. After 2 weeks the use of mineral make-up is recommended. You will need to use frequent artificial tears for the first 2-3 weeks following surgery. It is preferable to use preservative free drops if you have any allergies. These will be prescribed for you e.g. Hyabak drops, Hylotears, Hylotears Forte, Systane eye drops preservative free, Viscotears preservative free, Liquifilm tears preservative free, or Celluvisc drops and Lacrilube ointment, VitaPos ointment or Artelac night time gel at bedtime. It is often recommended that you use Lacrilube ointment to the eyes 1-2 hourly for the first 48 hours after surgery following any upper lid surgery but note that this will cause blurring of vision. (You should not drive for the first few days after surgery). These medications can be purchased from Face & Eye or online from the clinic’s online shop (www.faceandeyeshop.co.uk). To learn more about Eyelid Surgery in Facial Palsy, please contact us at today to schedule an appointment.